Picture Detective, available for iPhone and iPad through the Apple iTunes App Store, and for Android from the Google Play store, is a picture/word association game that provides a decent and interesting challenge, regardless of your skill level. The game presents you with a series of pictures, all relating to a certain word. You must use the pictures to try to figure out the word they are hinting at, using both the pictures and a variety of clues. To guess the word, you get three hints ‘for free’. You have the two pictures, and also are given the number of letters in the word, which for some of the puzzles is more than enough but there will be a few head scratchers that you really will be stumped on. It is here that you can spend coins on extra clues, starting with two more pictures and also including the options of revealing letters, showing an anagram or a written hint. Each clue is pretty cheap, and you get 200 coins included with the game, with more available to buy at pretty generous prices. You can even choose to skip levels for a measly 5 coins, if you so choose. – Can’t identify the Word? You can request a further two Picture Clues. – Not making the links between the Picture clues? You can reveal a Written Clue. – Still unable to make the connection? You can request an Anagram. – Need more assistance? You can reveal a letter. – Determined to solve the puzzle using just the two Picture Clue? You can skip the level and return to it later. While there is a wide variety of clues on offer, I think the real fun here is in solving the puzzles using just the two picture clues given at the start of each puzzle, and just skipping levels when you get stuck. It is good that the clues are there, however. I liked the theme of the game, where each puzzle is presented as a case that must be solved as it does add a real sense of style to proceedings and helps to tie all the different aspect of the app together. 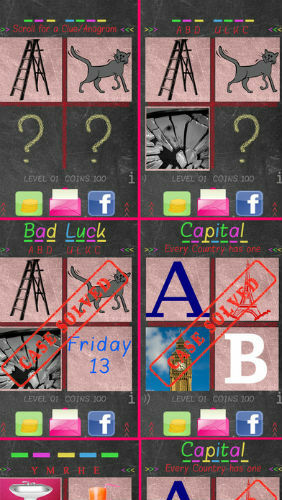 The game looks decent enough, and uses the real estate of the screen well, in order to get access to all the clue options in as neat and tidy a way as possible. The sound design is rather too simplistic for my taste, and I think more could be done here in the future. Overall, the presentation is very good, and all the puzzles are well thought out and offer just the right level of difficulty to present a few problems, but still enable you to relax while playing. Highly recommended if you are in the market for a new word based puzzle game.